Travel through time, meet 25+ dinosaurs and discover that science is everywhere in this interactive LeapReader book! Then, play Dinosaur Jungle Survivor with interactive dinosaur game cards. Age 5-8 years Features Discover what these Jurassic giants fed on, how they defended themselves, where and when they lived and much more. Rev up the time machine for an introduction to paleontology and explore the Cretaceous, Jurassic and Triassic periods. Learn all about how fossils form, and then be a dinosaur detective and help Professor Quigley identify mystery fossils. About the Series The Learn through Reading Series supports reading development by providing children with knowledge-building opportunities in areas of personal interest. 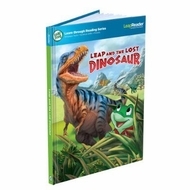 Learning Difference In Leap and the Lost Dinosaur, information about dinosaur sizes, habitats and more is woven into a compelling story that helps children understand the facts. The Learn through Reading Series supports reading development by providing children with knowledge-building opportunities in areas of personal interest. Works With Tag Reading System and LeapReader Reading & Writing System (sold separately).